Everyone has a different system for keeping their home networks secure. And by "secure" I mean "safe from cheapskate neighbors looking to poach some free Internet." Some users rely on their router's WPA encryption capabilities, while others employ MAC address filtering. Some do both. I'm not wild about either approach, as they involve a lot of hoop-jumping when I need to add new PCs and devices to the network. Instead, I'm a fan of invisibility. I've taken the simple step of turning off my router's SSID broadcasting, effectively making my network invisible to the neighbors. Hey, they can't steal what they don't know is there, right? If you've ever detected an unfamiliar network in your own home or, say, the local coffee shop, you know what I mean. Stray Wi-Fi router signals are bouncing all over the place. But a PC can see these networks only because of SSID broadcasting. Turn it off, and it's like the router isn't even there. Of course, it's there for your PCs and Internet-connected devices. So how do you connect them to an invisible network? Just enter the network name manually. In Vista, for example, head to the Network and Sharing Center, click Set up a connection or network, and then choose Manually connect to a wireless network. Enter your network's name (as designated in the router) and you're good to go. You should also check Start this connection automatically so you don't have to repeat this process, and Connect even if the network is not broadcasting to overcome Vista's natural resistance to invisible networks. If you don't know how to turn off your router's SSID broadcasting, check the manual. 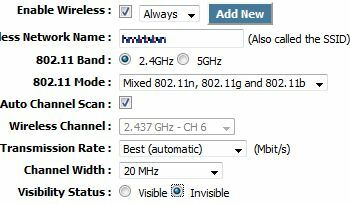 In my D-Link router, the setting is actually called Visibility Status; your mileage may vary. This is by no means a bulletproof security solution. I'm sure many users will call me foolish, reckless, and other choice words. But because I have suburbia-oriented security needs, I don't feel the need for encryption, filtering, and other heavy-handed measures.